SALEM, Ore. – The Josephine County Board of Commissioners is moving forward with an ordinance targeting “smart meters,” even with the threat of legal action from state officials. The new digital meters—installed free of charge—can help shorten outages and provide usage data to increase efficiency, Pacific Power said. Customers can even track their usage hour-by-hour in order to make any adjustments to reduce their power usage. This data will be available via a secure website. The smart meter rollout in Josephine County was met with concern from community members. Some of them took an issue with alleged radiation emissions, others were worried about privacy. Pacific Power said customers who choose to opt out would be charged an estimated $36 a month. Customers who request the removal of an existing smart meter will be charged a one-time fee of $169. In October of 2018, Josephine County commissioners passed an ordinance to put limits Pacific Power’s plans in their county and take the teeth out of the opt-out charge. However, the Oregon Public Utility Commission is in charge of setting charges. Josephine County will face a legal fight if they continue, according to the PUC. According to the PUC, the $36 charge is an estimate based on information and assumptions from 2017. 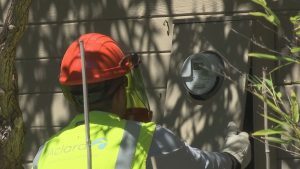 Pacific Power was asked to report back with new information regarding meter reading costs and alternative options for customers who’d like to opt out of the program. On November 9, Josephine County commissioners announced they’re moving forward with their “Consumer Utility Choice Ordinance,” set to go into effect on January 29, 2019.